We have had two new short films produced by Northern Heart Films as part of our Ribble Life Together project. The first short film looks at the work we are doing with farmers in the Ribble Catchment, and how it not only benefits our environment, but also the farmers who care for it. The second looks takes a light hearted look at how important it is to educate the next generation of river guardians, equipping them with the knowledge and skills that they need to look after the environment, and ensuring that it will stay with them forever. Over the summer the Trust have surveyed over 300 sites across the Ribble catchment. Our survey team do this to monitor fish numbers, particularly salmon and trout numbers. This helps us to gauge the health of our rivers and look for the areas which are doing well, and the areas which seem to be in poorer health. This year’s summer has been extraordinarily warm and dry, leading to lower river levels and higher river temperatures. This caused problems both for our team (who are more used to summer rain! ), and the catchments resident fish. 67 of our 333 sites had extremely low water levels and a further 6 were completely dry. Despite this there has been a rise in the number of salmon found in the Ribble and Hodder, with the Hodder yielding the highest numbers of salmon. However, there has been a drop in their overall distribution. This drop has been attributed to the warmer weather, warmer river temperatures, and low water levels. On the Calder trout appear to be thriving, with numbers doubling compared to last year. This is likely to be a sign of the species recovering following the Boxing Day floods, which decimated fish numbers in the Calder. However, salmon numbers here are still low here. Next year we are planning to survey more sites in this area and carry out further investigations into what could be preventing salmon from spawning here. It’s not all about salmon and trout. There are many other species that we find and record across the catchment. 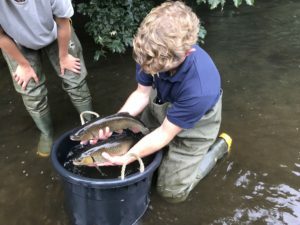 One notable discovery this year is the number of sites supporting juvenile chub. The fisherman’s favourite has been found at another 20 sites this year! 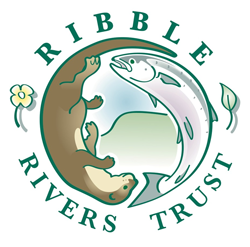 To find out more look out for an extended report in our 2019 newsletter, or our official report which will be uploaded to the Ribble Rivers Trust website soon. This festive season we’re asking people across the UK to help keep our rivers and beaches clean by making sure all their leftover cooking fats and oils are put in the bin rather than poured down the sink. If leftover fat from cooking the Christmas dinner goes down the sink, even with hot water and washing up liquid, it soon sets hard in the cold pipes. When it mixes with other unflushable items, such as wet wipes and sanitary products, it creates what is known as a Fatberg. The Fatbergs then clog the sewerage pipes and stop the waste water reaching the treatment works as intended. This means the risk of sewage spilling out into homes, streets, rivers and seas is substantially increased and this type of pollution is particularly bad for the invertebrates, fish, mammals, and birds that call the river their home. Enjoying nature and being active often go hand in hand. Spending time outdoors in natural spaces is known to provide a range of benefits from increasing fitness and activity levels to improving mental wellbeing. This is one of the many reasons why we are producing a range of river walks across the Ribble catchment. In total there will be 15 river walks which will take in a variety of locations; many which have benefited from our river restoration and habitat improvement work. The walks vary in length from 2 to 9 miles so there will be walks for everyone to enjoy. The Park View 4U gates feature as a waypoint on the Ribble Estuary walk. Walk guides will be available on paper and as downloads on our website. Our Ribble Life app also contains a section for the walk guides which incorporates audio clips, photographs, short film clips, and animations to help users learn more about the catchment’s heritage and wildlife. The next routes to be created will focus on Hyndburn Brook, Sabden, Chipping, Slaidburn, and Barrowford. Walk guides can be downloaded our website, and the Ribble Life app can be downloaded for free from the app store- simply search ‘Ribble Life’. Paper walk guides are also available at all of our public events and shows. The Calder and Brun walk takes in the impressive raised straight mile of the Leeds-Liverpool canal. We are hosting a series of 6 sketching workshops with local artist, Pat Southern-Pearce. So far two workshops have taken place, Horton in Ribblesdale in October and Padiham in November. Attended by a mixture of experienced sketchers and novices, the workshops cater for all abilities. Situated at various locations on the Ribble Catchment, the workshops aim to encourage an appreciation of our local watercourses and a engage with a wider audience. Horton in Ribblesdale – based at the village hall, the first workshop took place towards the top of the catchment in the shadow of Pen-y-ghent. With the weather being a little wild during the morning, initial tuition took place indoors. In the afternoon, most participants were able to get outside to sketch or at least take photographs to sketch from indoors. Padiham – located at the Town Hall, our second workshop featured the more urban setting of the River Calder. Dry weather allowed a couple of sessions sketching outdoors during the day. Participants were able to sketch right by the Calder, and the river features quite prominently in the finished. All workshops are £10, 10am-4pm, with lunch included. Workshops include some tuition indoors from Pat with the opportunity to sketch outdoors by the river if the weather permits. Our 2018/2019 winter tree planting season is almost upon us! This year we have nine woodlands which are being planted as part of Ribble Life Together, and a further three being planted as part of our work on the Forest of Bowland AONB’s Pendle Winns project. The Ribble Life Together woodlands will be planted with Jonny, and the Pendle Winns woodlands will be planted with Richard, Michelle, and Ellie. This means that throughout much of the season we’ll be planting two separate sites at the same time, so there will be plenty of volunteer opportunities! This autumn we’ve been talking about bats! As part of our engagement activities we have run two bat walks along the river side next to our office, both of which were fully booked. In total the walks attracted 39 adults and children, many of whom have never been to a Ribble Trust event before. The weather was fine to us on both nights and the bats were out in force. There really was an abundance of bats! There has also been a half term bat box workshop. This gave the 27 children that attended the opportunity to learn about bats and rivers and make bat boxes, bat badges and origami bats. Plus the parents seemed to enjoy it as much as the children. The activities have been organised with the help of Pat from Ecology Services UK Ltd, who is a local bat expert. Pat’s passion for bats has really helped us to engage with the adults and children taking part in the activities. Together we’ve helped a whole new audience learn more about the types of bats that we get in the UK. They’ve also discovered background information about bats, and why rivers (particularly tree-lined rivers) are important habitat for bats. The results of this year’s annual photo competition have been announced. The standard of photos was very high again this year and with 75 entries it has proved even more popular than last year. With the high numbers and high standards, it took some deliberation and debates before the judges agreed on the winners! To view the shortlisted entries visit our competitions page. Monitoring is an important part of our work. It helps us to gauge river and habitat health and to discover what species are inhabiting areas of our catchment. It also helps us to determine whether the river’s health is improving. 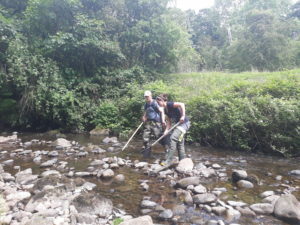 Following our fish passage schemes at Hoghton Bottoms, Oakenshaw, and Lower Darwen we’re using radio tracking studies to monitor the movement of fish up the fish passes we have created. The weirs which we carried out work on were known to be posing a barrier to fish migration, with our studies prior to work being carried out showing that few, if any, fish were migrating upstream of these barriers. Although monitoring is still ongoing we already have some positive results. At Lower Darwen 16 of the 20 trout that were tagged have moved upstream through the fish pass, with 3 of 16 having moved successfully up Hoghton Bottoms fish pass. At Oakenshaw, which was completed last year, 3 of 19 tagged trout have moved upstream. Additionally, a juvenile salmon, also known as a parr, has been found upstream. This indicates that the fish pass had been used last year. There are many methods of monitoring fish. In the case of these sites manual tracking was agreed to be the best option for tracking based on location, accessibility, and stream size. The fish used in the study were first captured via electrofishing and then tagged with radio transmitters. Each transmitter was set at a different frequency range and pulse rate which helps to identify individual fish. The fish were then tracked on foot from the bankside using a receiver.